1. Preheat oven to 200° C grill setting. 2. 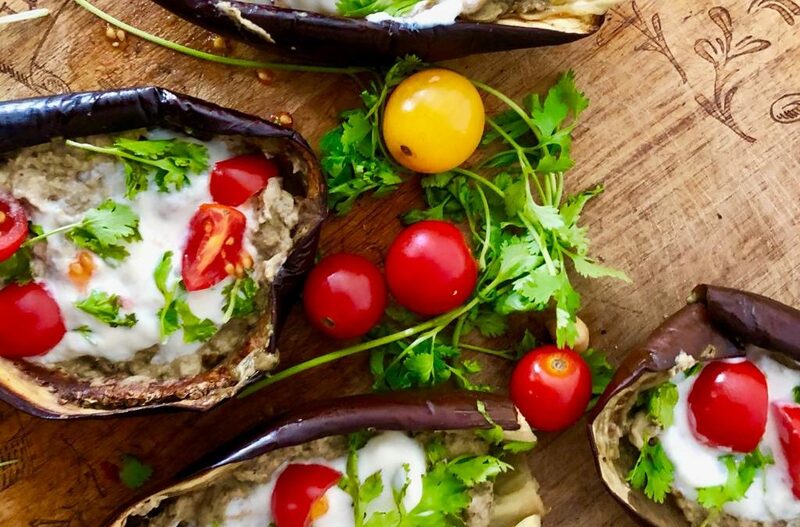 Start by cutting the aubergines in half and massage them with the olive oil, salt and pepper. Place in the oven and cook for 35-40 minutes. 3. Once the aubergines are cooked, remove from the oven and gently scrape the flesh from the skins with a spoon. Throw the scooped insides into a food processor with the tahini, garlic cloves, lemon juice, date syrup, cumin, salt and pepper. Pulse until well combined. 4. Using a tablespoon, scoop some of the mixture back into each aubergine skin. Add some plain vegan yoghurt on top. Add some cherry tomatoes and chopped coriander.